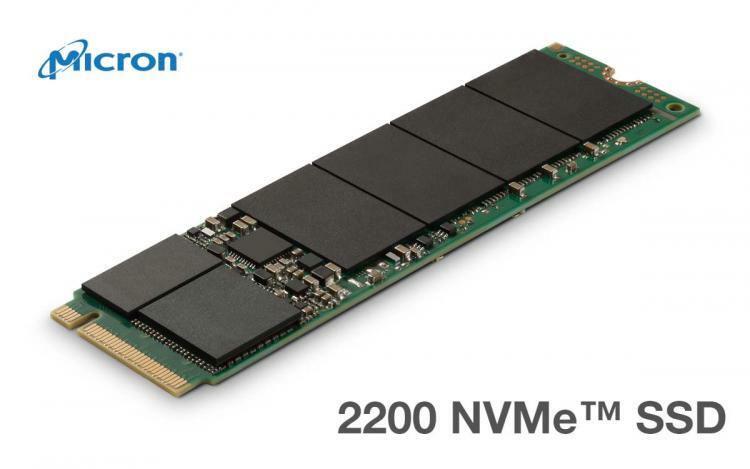 Micron presents its newest PCIe NVMe solid-state drive for client computing – the Micron 2200. It is designed to create faster and power-efficient client PCs with its increased bandwidth and reduced latency. The Micron 2200 NVMe solid-state drive uses 3D TLC NAND flash, internally designed ASIC drive controller and firmware. The Micron 2200 offers speeds of up to 3,000MB/s sequential read speeds and up to 1,600MB/s sequential write speeds with random read/write IOPS of 240K/210K. The Micron 2200 uses the M.2 2280 form factor, available in three capacities: 256GB, 512GB, and 1TB. All capacities also come in a Self-Encrypting Drive variant that utilizes an AES-256-bit XTS hardware engine that complies with the TCG Opal 2.0 standards with no impact on performance. The Micron 2200 PCIe NVMe SSD is streamlined to meet the needs of the average consumer with standard Windows 10 operating systems. It is offered at an affordable price point making NVMe speeds a more cost-efficient storage solution. The Micron 2200 PCIe NVMe SSD is designed for constrained spaces with its M.2 form factor. It comes with an adaptive thermal monitoring feature that limits the heat generated by the SSD to keep it cool at all times. The Micron 2200 is available with the Self-Encrypting Drive (SED) Technology which uses AES-256-bit XTS hardware engine that complies with Opal 2.0 standards without any impact of the SSD’s performance. Micron did not reveal pricing for the Micron 2200 PCIe NVMe SSDs but online retail prices suggest an MSRP of $130, $220, and $360 USD respectively for the 256GB, 512GB, and 1TB models. Learn more about the Micron 2200 PCIe NVMe SSD here.